Pottery under Inca flourished because potters didn't have to think of earning, their foods and clothes and other necessities were supplied by government. 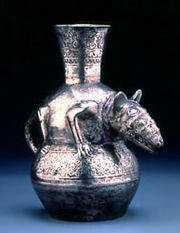 Potters and other craftsmen like silversmiths, goldsmiths and stonemasons during Inca period lived in towns. Their products were used by the government and by the nobility. They didn't have to worry about the food for them, as foods and wools for cloth were supplied to them from the government warehouse. When Inca government flourished in Andes, already pottery was the most developed art in that region, as people of that regions were making things of clay for several thousands years. So when Inca conquered them, there was already a good numbers of skilled potters in that area. Suitable clays for pottery were available in Andes. There were very fine clays available around Cusco. In those days potters did not use potter's wheel. They made the the pot in simple ways. Potters made the desired shape with hands, Sometimes they placed a pot on a rounded, specially molded plate and twirled it. To get a thinner finish they used smooth stones. A stone was put inside a freshly made pot, then it was pressed against the metal. During Inca regime pots were decorated with different geometric designs. usually they used red, black and white colors. They did the designs so well that they looked like woodwork or metalwork. Some villages had favorite designs. Different regions had their own designs. Though pots of one region had verities, still they had something in common, with which people could identify, which region a pot belonged. Again all the regions under Inca had some similarity. Potters likes to use heads of different animals on pots. Usually they put the animal head at the top of the pots. Lots of pots were found with bird heads. Placing a bird head on shallow dishes were one of the popular item. Favorite colors among the potters were red, orange, and yellow. In lot of cases they used black and white colors. Like other Andeans people they used geometric shapes very frequently. Lots of ceramics were found with diamonds, circles, triangles, squares, checkers, and dots. Another popular item was using animal, birds and insects. They used llamas, jaguars, alpacas, birds, butterflies and bees. In Inca pottery we can detect presence of two major streams. The first first derive from Chimu techniques with Mochica reminiscenes, notably in the lustrous black ware made by the north-coast potters of Chanchan and Lambayeque. The stirrup spout persists alongside the single spout vessel, both of which display fine and very varied anthropomorphic and zoomorphic motifs. Other mass-produced wares, however, are of lower quality. A greater degree of originality is discernible in the second of the two streams in which the forms and motifs are typically Inca and the style totally distinct from any other. The palette used by these potters suggests they were of Nazca origin and had been imported into the high lands. The pottery is characterized by the introduction of a new form, the so called aryballos, namely a large globular jar with a conical base that could be implanted in the ground like the amphora of antiquity. 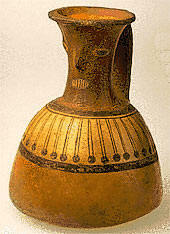 Aryballos was used for transporting water, it was carried on the back.